Register for all three Summer School Instructional Design workshops and receive a $100 discount. Visual design and design thinking are crucial skills for every instructional designer. In this workshop, you’ll focus on how to implement graphic design best practices when funding is limited. We'll review strategic design processes that you can apply to all aspects of your learning solutions from PPTs to eLearning courses to job aids. To solidify your understanding of these crucial design principles—like formatting, fonts, color theory, and more—we’ll work through a number of hands-on projects that will give you real experience that you can bring directly back to work the next day, all to create a more productive work environment and improve ROI while making your work life more satisfying than ever before. Sarah Baytop Scott is an established grassroots organizer with a diverse background in community organizing, creative marketing, design, data analytics, and field organizing. 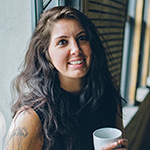 She teaches workshops focused on design and marketing. Her professional experience spans over 10 years, with a focus on helping community organizations design for their needs within a limited budget. She helped found the tech startup Activate AI, which is working to develop technology tool kits for nonprofits and other organizations, as well as a design firm focused on connecting freelancers to reliable work. Join us this summer to discover and practice the underlying principles and key technical graphic design, eLearning design, and performance measurement skills you need to improve your daily performance. Deepen your understanding of these topics to create a more efficient flow to your workday. While each of these workshops are available à la carte, you can save $100 by registering for all three. Reach out to Jeannette for registration questions.